Rock and roll scholars depict the Bonnie Bramlett tale as an epic drama, and it most certainly is. But what the cognoscenti sometimes miss is the extent of this towering singer’s contribution and her current role as one of America’s greatest interpreters of the soul, R&B and jazz songbooks, bar none. In an era of safe singers, when massaging the public consciousness with smooth sounds is a sure way to commercial success, Bonnie Bramlett’s joyous and soulfully hard-won vocals reflect a real life fully lived &#8722; bruises, beauties, and all. What will surprise anyone who has followed Bonnie’s career is that not only does Roots, Blues & Jazz find her singing up a storm, but that her vocals are consistently stronger than most nu-soul stars half her age, and astonishingly, she is only getting better. As a teenager, Bonnie Lynn O’Farrell performed in the dangerous dives of St. Louis with local legends Albert King and Little Milton. By 15, already a toughened musician with an amazing delivery, Bonnie became the first white girl to tour with Ike & Tina Turner as one of their Ikettes. Afterwards, she returned to St. Louis to continue her education vocalizing with jazz greats Stan Getz, Dexter Gordon, King Curtis, Miles Davis, and Wes Montgomery. Fate called when in 1967 Bonnie moved to Los Angeles where she met and married Delaney Bramlett. Soon the supercharged southern duo were signed to Stax Records, their gospel inspired rhythm and blues landing them an opening slot with seminal supergroup Blind Faith. The duo’s reputation rose like a comet when Eric Clapton left Blind Faith to join Delaney & Bonnie and their crack band on a European tour (heard on the classic Delaney & Bonnie & Friends On Tour). Bonnie had by then grown into a consummate songwriter, her songs eventually interpreted by The Staple Singers, The Everly Brothers, Lester Flatt, The Allman Brothers Band, and Hank Williams, Jr. Going solo, Bonnie cut three albums for Capricorn Records in the 1970s, and also graced many important recordings as a backup or featured guest vocalist on classic albums by Little Feat, Delbert McClinton, Rita Coolidge, Carly Simon, Dave Mason, and Joe Cocker. As the industry changed and the ‘70s became the ‘80s and the ‘90s, Bonnie turned her magnetic stage presence to acting, landing parts in Oliver Stone’s The Doors and a recurring role in the #1 rated television show, Roseanne. (Bonnie is currently in production for the Kevin Costner thriller, Guardian, playing “the blues singing mama who owns the bar,” Bonnie laughs). After time off for reflection and repose, Bonnie made her way back to the music via Nashville. 2002’s I’m Still The Same found Bonnie’s trademark tenor howl rising from the grooves like a soaring bird. Blues, Jazz & Roots signals her full scale return to the soul sounds that forged her talent in the fires of St. Louis and Los Angeles, today wiser, smarter, and singing like a soul giant inspired. So what was the goal for Blues, Roots & Jazz? 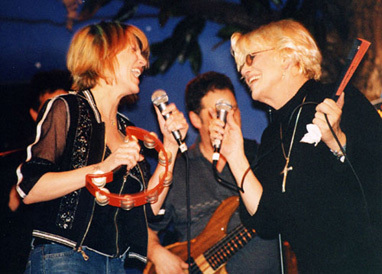 Bonnie Bramlett, with her daughter Bekka who also contributed background vocals to the recording. Aiding in this expression is her band, Mr. Groove, a Nashville based ensemble who have worked together since the mid-1980s, and founded by the brothers Tim and Roddy Smith. 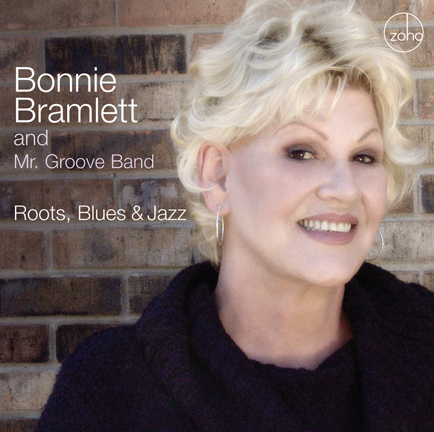 Mr. Groove’s cohesion is the bedrock on which Bonnie Bramlett is set free. Mr. Groove’s contribution to Roots, Blues & Jazz is multi-faceted. They are expert interpreters of the soul-jazz and R&B idioms, and are also inspired arrangers who  far from replicating cover versions  can re-create familiar songs in a completely fresh and new light. The gospel-tinged “Love the One You’re With” and the swinging intro to “No Particular Place to Go” are especially powerful examples. Blues, Roots & Jazz runs the gamut of Bonnie’s history and fulfills her desire to “grow up into a jazz singer.” Her joyous spirit fills Steven Still’s “Love The One You’re With,” Chuck Berry’s “No Particular Place to Go” and Joe Zawinul’s “Mercy Mercy.” Bonnie interprets classics like “A Change Is Gonna Come” and “Work Song” with a gritty depth that only comes from a life fully lived, scars worn as badges as of honor. But the true soul of Blues, Roots & Jazz is in Bonnie’s original songs and select covers which reflect her soul-drenched heart. Bonnie’s readings of “I’m Confessin’” and “That Lucky Old Sun” are sublime, slow burners where she channels the ghosts of jazz greats long gone. “The blessing is that the minute [pianist] Steve Willets started playing those songs we started singing them,” Bonnie recalls. “I was thinking of Louis Armstrong for both songs. I searched the archives of my heart and mind and soul. The album also contains the first recorded collaboration between Bonnie and two original members of the Ikettes, Robbie Montgomery and Jessie Lucas, on August 30, 2005 in Nashville  over 40 years after Bonnie’s stint with the Ike & Tina Turner Revue! As expected, this reunion was both emotional and great fun. Equally impressive, the album documents the first recording of Bonnie with her daughter, Bekka Bramlett, whose own career as a singer included a memorable stint with Fleetwood Mac in the 1990’s. Not surprisingly, Bekka has inspired Bonnie. Recorded at The Groovehouse, Nashville and GAT 3 Recording, Charlotte by Jimmy Dulin and Glenn Tabor, from January to September 2005. Additional recording at The Groovehouse, Nashville, Studioeast, Charlotte, and Saxworks, Charlotte by Tim Smith, Roddy Smith, Mark Stallings, Tim Gordon, and Jimmy Dulin. Mixed and mastered by Phil Magnotti at Silvermine Studio, Norwalk, CT, except “No Particular Place to Go” and “Gotcha” mixed by Kevin Ward at Kilowatt Productions, Murfreesboro, TN. Produced by Bonnie Bramlett and Tim Smith. Photography by Thom Bresh. Package design by 3 and Co., New York. Executive producers: Tim Smith, Roger Davidson & Joachim Becker.